I had to go to Seattle this past week. 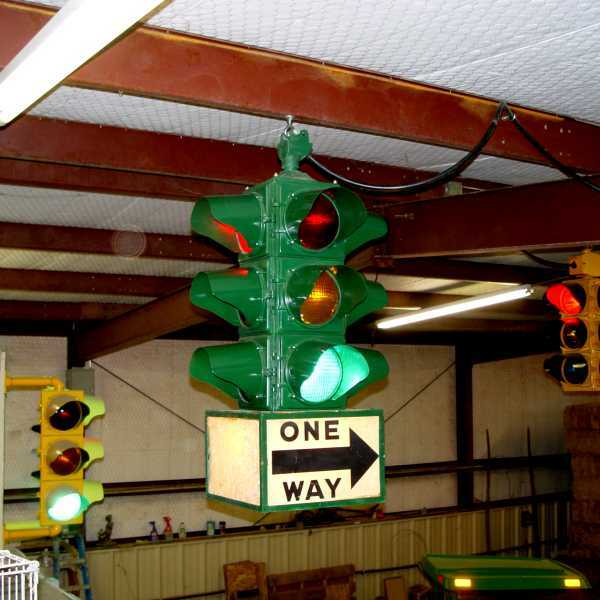 What a treasure trove of old street lights and traffic signals. Here are a couple of snaps. In the 1800s light bulbs had limited candlepower so they brightened things up by installing posts with multiple luminaires. 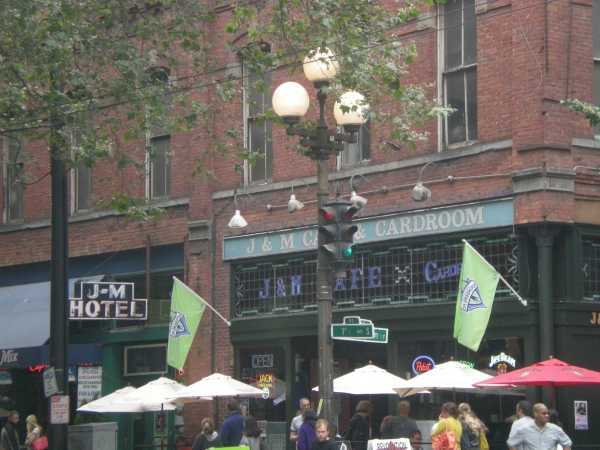 You can go to http://maps.google.com and search out Pioneer Square, Seattle, WA. Then call up the street view and surf the neighborhood. I bet they are made of cast iron? and the Poles are Complete with the Cool 3 Way's! Sorry to tell you, but while the lights LOOK vintage, they are not...they are reproductions. I work just blocks from there. The downtown lights have been through several iterations and if you are interested in the history, search for "street lighting" on the Seattle Municipal Archives Photo Site. There WERE clustered lights, but they aren't the same exact ones. The current 3-lamp fixtures were (and some still are) HPS, but there are many that have been changed to new QL induction fixtures (white light). A big improvement. 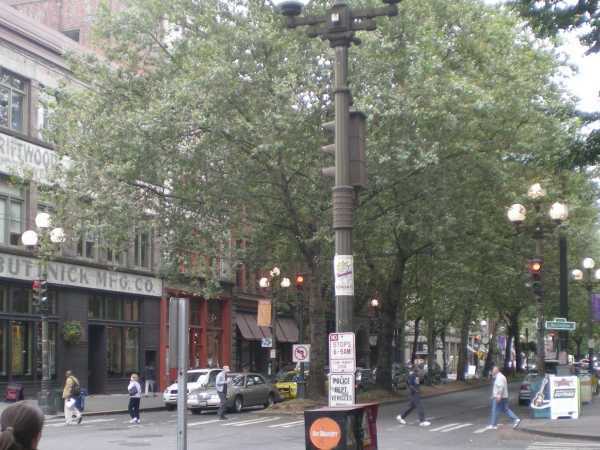 The cluster light in the first photo in Pioneer Square actually has CFLs in it now (it was incandescent even a few decades ago before that area was re-done). Some of the cobrahead poles for the actual street lighting (mostly holding 400w M-series GE luminaires) have been there since the 1950's, when they held Form 109's. 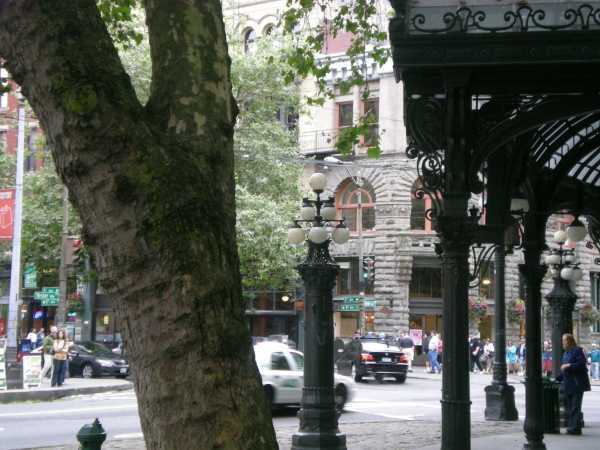 Old Town / Pioneer Square is supposed to have original light standards. Naturally the guts have been upgraded. There was a big hullabaloo a few months back when a truck took down one of the standards and they wanted to make sure that it remained serviceable. The pergola was knocked down (or at least one end of it was) by a truck years back and rather truck proof replacement parts were cast - resembling the original poles but like 4 times as thick. Ironically the ballard at 1st and Yessler that looks as if it was there to protect the pergola is simply lag bolted to the concrete. I would have loved to have seen the old Form 109s when they were in service on the taller poles.